The recent growth in apartment construction is yielding some creative benefits for would-be renters. In an effort to appeal to a more diverse group, each amenity goes straight to the heart of lifestyle and often addresses problems that might have once motivated renters to seek out homeownership. Essentially a single hotel-style room, this favorable amenity offers support to residents who want to stick with a smaller floor plan, but also offer something to occasional guests. At the Alexan at Briargate, this extra space rents out at $75/night and adds thousands in revenue to the project each year. The unit is attached to the fitness center and guests also have access to all the project’s amenities. The project avoids paying occupancy tax because only guests of residents can use it, and the residents are responsible for any damage that the guest may incur. Being pet friendly is more of an expectation than an amenity today, and now some projects, like the Vistas at Jackson Creek, are making it easier for renters to deal with the dirty-work of pet ownership. 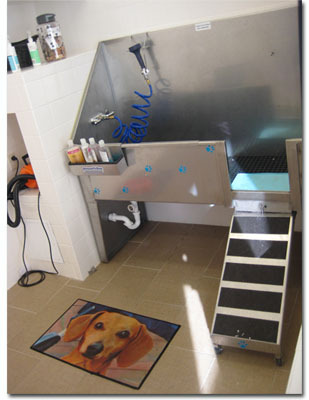 Bathing stations like the one pictured here can benefit tenants two ways: saving money on professional grooming while removing the mess from their own living space. During a recent visit to Tempe, Senior Vice President Peter Dennehy discovered a project where the developer’s plan includes outdoor courtyard space and patio that is specifically designed to accommodate fancy food-truck vendors for residents during certain times of each day, and also for special events. Argo at Towne Lake is a mixed use design that will begin leasing in 2013. If you have any questions, please contact us at (949) 870-1200.